Organ donation is not a subject that usually pops up in casual conversation, something Todd and Tara Storch — founders of Taylor’s Gift Foundation — know well. So Taylor Blue nail polish was born. The couple established Taylor’s Gift after losing their 13-year-old daughter, Taylor, in a skiing accident in March 2010. Taylor’s Gift supports and promotes official Donate Life organ donor registrations in the United States. April is National Donate Life Month. “We knew we needed a ‘conversation starter’ about organ donation,” Tara Storch says. “We’re aware that this isn’t an easy topic for most people, so we decided we needed something that could make it easier to talk about. “Since our largest support group comes from women 18-44, we decided that a nail polish would be a great way to spark conversation. Taylor had the most beautiful eyes in a gorgeous blue and always got compliments on them. Only a week before the accident, she said to me, ‘Mom, I love the color of my eyes. That’s the color I want for my bridesmaids dresses someday.’ From that point on, that color was precious to us, and there was no question the color of the nail polish would be Taylor Blue. That includes Jeff Probst, host of the CBS reality show Survivor. When Todd and Tara appeared on The Jeff Probst Show in May 2013, Probst painted his thumb nail with Taylor Blue to show his support and registered as an organ donor. He has recently been announced as a spokesperson for Taylor’s Gift Foundation. Taylor Blue, created by OPI, will be available for purchase on www.TaylorsGift.org through the end of April. The 2013 Paint It Forward campaign raised $40,000.The goal for 2014 is $100,000. 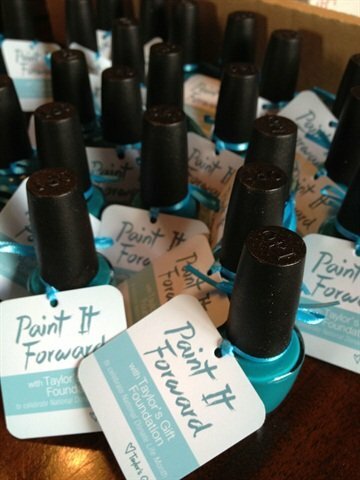 Net proceeds from Paint It Forward support the mission of Taylor’s Gift and its Legacy Gift program, which provides financial help to families touched by organ donation. For more information, visit www.TaylorsGift.org. You can also check out Facebook: https://www.facebook.com/TaylorsGift; YouTube: http://www.youtube.com/taylorsgift;Twitter: https://twitter.com/taylorsgift; and Instagram: http://instagram.com/taylorsgiftorg#.